Physiotherapist-Sioned Davies. Paediatric Physiotherapist Therapy Stars. Since graduated from Cardiff University with a First Class honours degree in Physiotherapy. 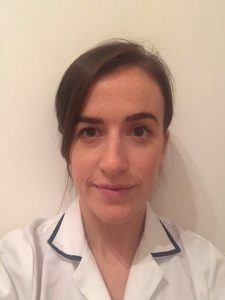 Since then Sioned completed her general rotations at the Walton Center for Neurology and Neurosurgery, Liverpool and the Countess of Chester Hospital. She completed a variety of rotations for example, musculoskeletal outpatients, amputee rehabilitation, respiratory (intensive care unit and ward based care), neurology and stroke rehabilitation. In 2016 she became static in Paediatrics. Sioned is very lucky to work in a variety of setting; special provision schools, hydrotherapy, outpatients and respiratory clinic for example Cystic Fibrosis. Sioned is very passionate about her job and providing the best care of children and families. In 2017 she completed her masters in Clinical Research at Manchester University (MREs). She has also attended conferences (Association of Paedaitric Chartered Physiotherapists 2018), training such as lycra with DM Orthotics, Cystic Fibrosis study days at Alder Hey Children’s hospital. Sioned is also actively involved in the paediatric in-service training delivered at the Countess of Chester Hospital. Sioned has experience of managing complex caseloads of neurological and respiratory nature. She enjoys working as past of a team and believes communication is essential in the care of every patient. She ensures treatment plans are led by the patient goals. Sioned has experience in dealing with specialist equipment such as standing frames and seating. Sioned is a member of the HPCP, CSP, APCP ((Association of Paediatric Chartered Physiotherapists) and ACPCF (Association of Chartered Physiotherapists in Cystic Fibrosis). Sioned’s future aspiration is to continue developing as a caring Paediatric Physiotherapist and completed a Phd. Outside of work Sioned enjoys spending time outside walking, running, paddleboarding, yoga. She also is a keen baker.